Google announced Thursday that the number of requests for individual user data by the US government has increased threefold in the same number of years. The Search Engine’s statistics, released in its Transparency Report, show that In the six months of 2013, the government issued 10,918 requests for data on 21,683 users, a huge increase on just 3,580 requests in the latter half of 2009, when Google first began compiling the figures. The number also represents a 32 percent jump on the 8,438 user data requests that were submitted by US government entities in the last six months of 2012. “Since we began sharing these figures with you in 2010, requests from governments for user information have increased by more than 100 percent,” writes Richard Salgado, legal director for Google. The requests were made at the local, state, and federal levels of government, and include subpoenas for direct access to IP addresses, names, and detailed account information, in addition to search warrants issued by police for emails, photos and videos. According to Google’s report, the US government easily tops the list of worldwide requests, with 25,879 total worldwide requests submitted, covering 42,500 users. This means that over half of all users affected were targeted by the US government. 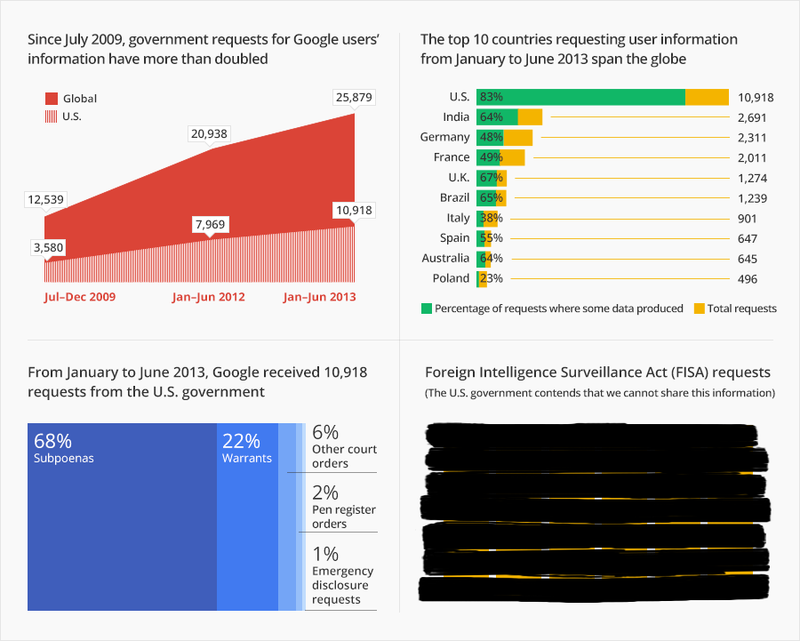 Google indicates that it agreed to 83 percent of the US government requests, overall complying with 63 percent globally. However, the statistics DO NOT encompass surveillance at the hands of the NSA, with which Google’s intimate relationship has been well documented. Google is effectively under a gag order at the hands of The Foreign Intelligence Surveillance Court (FISA), which has refused to allow private companies to publish details of requests for information, citing national security as justification. Google is one of several companies, along with Apple, Yahoo, Facebook and Microsoft, that claim they are pushing for more transparency on US government spying on users of their products. The companies are suing for the right to publish more details, arguing that they have a First Amendment right to do so. “We believe it’s your right to know what kinds of requests and how many each government is making of us and other companies,” Salgado wrote in the Google blog on the matter. “Earlier this year, we brought a federal case to assert that we do indeed have the right to shine more light on the FISA process. In addition, we recently wrote a letter of support for two pieces of legislation currently proposed in the U.S. Congress.” Salgado added. As Google is still compiling the data, it remains to be seen how many takedown orders Google received from US authorities pertaining to “government criticism”. In 2011, it was revealed that the demands to remove information, including videos containing “government criticism,” increased by 70 per cent. As we have previously documented, Google-owned You Tube has complied with thousands of requests worldwide to remove political protest videos that are clearly not in violation of any copyright or national security interests and do not constitute defamation. “As our most personal information continues to move online, where physical barriers to government access are diminished, it’s vital that our laws are updated to protect against warrantless searches.” Harris added.